Eric Henry Liddell, c. 1923. Eric Henry Liddell (January 16, 1902 – February 21, 1945) was a distinctive rugby player for the Scottish national team and a missionary. He was the winner of the Men's 400-meter and a bronze medal for the 200-meter events at the 1924 Summer Olympics held in Paris. Even though Eric Liddell had fame and riches within his grasp, he chose to live a dangerous and humble life in China. People of faith everywhere have been inspired by the giving heart and unwavering conviction of Eric Liddell. He considered Sunday to be sacred, a day set apart for the Lord. Honoring his convictions, he refused to run his best event on a Sunday in the 1924 Olympics. This aspect of his life was depicted in the movie Chariots of Fire. His surname rhymes with "middle." Eric Liddell, fondly called the "Flying Scotsman," was born in Tientsin (Tianjin) in North China, second son of the Rev & Mrs James Dunlop Liddell. His parents were Scottish missionaries with the London Missionary Society. Liddell went to school in China until the age of five. At the age of six, he and his brother Rob, who was two years older, were enrolled in Eltham College, Blackheath, England, a boarding school for the sons of missionaries. Their parents and sister Jenny returned to China. During the boys' time at Eltham their parents, sister and younger brother Ernest came home on furlough two or three times every year and were able to be together as a family in Edinburgh. Eric and Rob were both exceptional athletes. 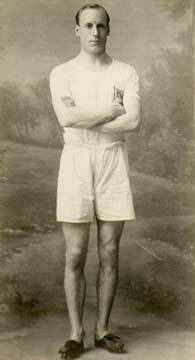 Eric Liddell became well known for being the fastest runner in Scotland. Newspapers carried the stories of his successful track meets and many times declared that he was a potential Olympic winner. No one from Scotland had ever won an Olympic gold medal before. Liddell was chosen to speak for Glasgow Students' Evangelical Union (GSEU) because he was so well known. The GSEU hoped that he would draw large crowds, so that many people would hear the Gospel. The GSEU would send out a group of eight to 10 men to an area where they would stay with the local population. It was Liddell's job to be the lead speaker and to evangelize the men of Scotland. Many came to see him because he was an accomplished athlete, but all heard his message of faith. In 1920, Liddell joined his brother Rob at the University of Edinburgh. Athleticsand rugby played a large part in Liddell's university life. He ran in the 100-yard track meets and the 220-yard meets for Edinburgh University and later for the Scotland national rugby union team. He played rugby for Edinburgh University and in 1922 played in seven Scottish Internationals. He graduated from the University of Edinburgh with a Bachelor of Sciences degree after the 1924 Paris Olympiad. During the summer of 1924 the Olympics were hosted by the city of Paris. Liddell a staunch Christian and, according to legend (perpetuated in the movie Chariots of Fire), refused to race on Sunday, despite the consequence that he was forced to withdraw from the Men's 100-meters race, his best event. In reality, the schedule had been published several months earlier, and his decision was made well before the Olympic Games began. Liddell spent the intervening months training for the 400 meters race, an event in which he had previously excelled. Even so, his success in the 400-meter was largely unexpected. Liddell also ran the 200-meter race, for which he received the bronze medal beating his rival, the favored Harold Abrahams, who finished in sixth place. Eventually Liddell's views on sports on Sunday changed. In his later years, he refereed soccer matches on Sunday for youth with nothing else to occupy themselves, and as a result were getting into trouble. After the Olympics and his graduation he returned to North China where he served as a missionary, like his parents, from 1925 to 1943. He first served in Tientsin (Tianjin) and later in Siaochang. Liddell's first job as a missionary was as a teacher at an Anglo-Chinese College (grades 1-12) for wealthy Chinese students. He used his athletic experience to train the boys in a number of different sports. One of his many responsibilities was that of superintendent of the Sunday school at Union Church where his father was pastor. During his first furlough in 1932 he was ordained as a minister of religion. On his return to China in 1934, he married Florence Mackenzie whose parents were Canadian missionaries in Tientsin. Together they had three daughters, Patricia, Heather, and Maureen. In 1941, life in China became increasingly dangerous so that the British Government advised all British nationals to leave. Florence and the children left for Canada to stay with her family when Liddell accepted a new position at a rural mission station in Siaochang, which gave service to the poor. He joined his brother, Rob, who was a medical doctor there. The station was severely short of help and the missionaries who served there gradually became physically exhausted. There was a constant stream of local people coming into the mission at all hours to get medical treatment. When Liddell arrived at the station, he found his brother had fallen ill and needed to go on furlough. Staying behind, Liddell reportedly suffered many hardships at this mission station. He is interred in the Mausoleum of Martyrs in Shih Cha Chuang, China. The city of Weifang, as part of the 60th anniversary of the liberation of the internment camp, commemorated the life of Liddell by laying a wreath at a memorial marking his grave in 2005. The memorial had been previously erected by Edinburgh University. The 1981 film Chariots of Fire commemorated the Olympic triumphs and contrasted the lives and viewpoints of both Liddell and Harold Abrahams. Eric Liddell ran for the glory of God and Harold Abrahams ran to prove his worth to a society that was anti-Semitic. Actor Ian Charleson portrayed Liddell and Ben Cross, Abrahams. One major historical inaccuracy in the movie surrounds Liddell's refusal to run in the 100-meters race. The film portrays Liddell as finding out that one of the heats was to be held on a Sunday as he was boarding the boat that would take the British Olympic team across the English Channel on their way to Paris. As noted earlier, the schedule and Liddell's decision were known well in advance. The scene in the movie where Liddell fell early in a 400-meter race in a Scotland-France dual meet and made up a 20-meter deficit to win the race is, however, historically accurate. Liddell's unorthodox running style, with his head back and his mouth wide open, is also said to be historically accurate. This page was last modified on 18 August 2017, at 21:07.